Created since hundred years ago, produced many times in various versions and in lots of formats, but still...the story never loses its audience...its beauty...its appeal. This one might be the most interesting and distinguished version of Snow White fairy tale I've ever seen. Blancanieves or Snow White in Spanish, will be available to watch at Europe On Screen 2014*. Grimm Brothers' version of Snow White might be a little bit dark, but Disney (through their story books or film) has made it much colorful. In 2012, Pablo Berger brought delight in another version of his and mixed up both sides. Pictured in black and white (and yes, it's a silent movie), Blancanieves is a must-watch. One day in 20s or 30s era in Spain, Antonio Villalta performed his usual show, bullfighting. Sadly, the unfortunate day injured him and it was also when he lost his beloved wife, Carmen de Triana. Yet, his daughter Carmencita was born on the same day, too. Deep sadness of terrible lost estranged himself from his baby 'Snow White'. Plus, a seemed-to-be calm and caring nurse, Encarna, stood up to stay by his side and cared for him... and then married to him. The tragedy let Carmencita lived with her grandmother without any father figure existed. When finally she was sent to his father's house, Carmencita started to figure out what actually had happened. The point of the story isn't changed though. Poor little girl who lost her parents and struggle under an evil step-mother's control, later joined a group of traveling dwarves. Well this time, they got 6 of them, instead of 7. Only we won't see any singing or crying in despair scenes, prince charming or talking magic mirror. I won't spoil the whole thing, but there's always the iconic poisonous apple and many unexpected twists. One strong difference I can say is... strength in main female character. 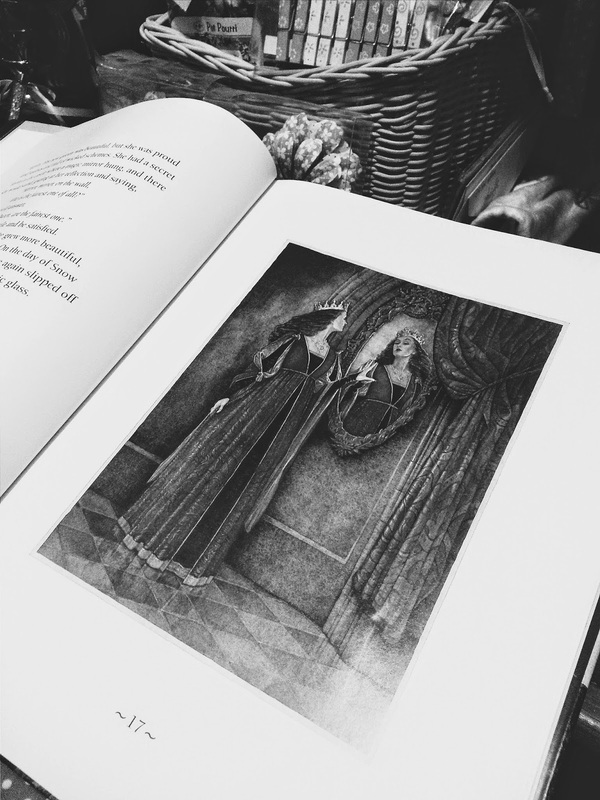 In story book just like The Candlewick version, femininity depicted through Snow White character as soft and kind-hearted woman which make her deemed weak in a way. What saved her then was the cheesy true love kiss and stuff. Compared to Blancanieves, this film brought up bigger picture of femininity. Not just because you're going to see a female bullfighter which was something uncommon at the time (maybe until today), but it's more likely to be seeing how reality might work---and that won't cause you dream too much on something good to come with doing almost nothing. Like Rumplestiltskin in Once Upon A Time TV Show always says that even 'magic comes with a price'. There she goes, just like in other Snow White scenes, growing up Carmencita or Snow White initiated her freedom by escaping from sort-of the 'huntsman' guy. She kept on surviving with the help of the six dwarves, certainly. My suggestion: It'd be better if you don't miss to see the sassy dwarf, the sweet and infatuated one...and the grumpy too. But no one knew where curveball might take her life path and what could save her life in the end. Personally I found it quite interesting that this Snow White didn't see any gender burden coming once she stepped on bullfighting arena. Within almost the same background story with strong Spanish touch, this version is a poetic stereotype breaker---showing beauty in bold personality, a dichotomous point most people will argue about. On the other hand, I like the way those characters developed: tortured and enslaved young Carmencita moving on by unspoken forgiveness and mad-then-bored Encarna. Through silence, we're reminded if Snow White stories we've been reading since kids will remain in fairy tales. Blancanieves has 'talked' so much, including how everything comes more logical apart from the happy ending ones that stuck in our heads for so long...and beautifully pictured the ironic depiction on actual women's struggle not to remain an object. World has changes, so has fairy tale Snow White---Grimm's version to Berger's. For those who has been poisoned by the old version, try this touchy-yet-funny one as your antidote. There are also other films you can watch for free from May 2nd to 11th 2014 and will be screening in 9 cities, Jakarta, Bandung, Aceh, Bali, Makassar, Medan, Padang, Surabaya and Jogjakarta. Some of the films are based on novels. Will write about it soon.